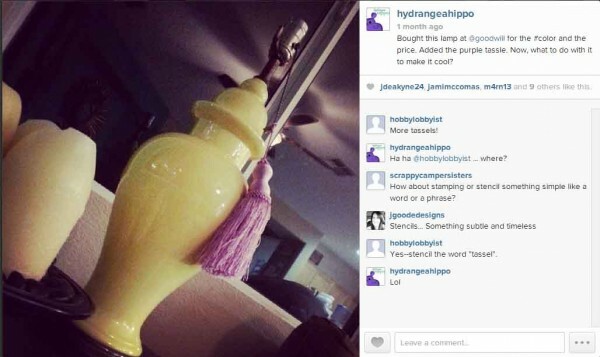 The lamp on its own was super plain and I posted a pic to Instagram a while back asking for some creative direction in how to jazz it up. Do I take a sharpie to it? Stencils? Spray paint? All of that seemed really permanent. What if I didn't like it? Then I received these gorgeous beads from Prima Bead to work with – perfection! It dawned on me to create removeable lamp “jewelry”. I could change it out for the seasons or as I changed the decor and nothing would be permanent. The “lamp necklace” fits around one section of the lamp and can be removed, using the lobster claw style clasp in the back of the necklace. I can change it seasonally or layer on more “necklaces” for a more bohemian feel or to add more texture. 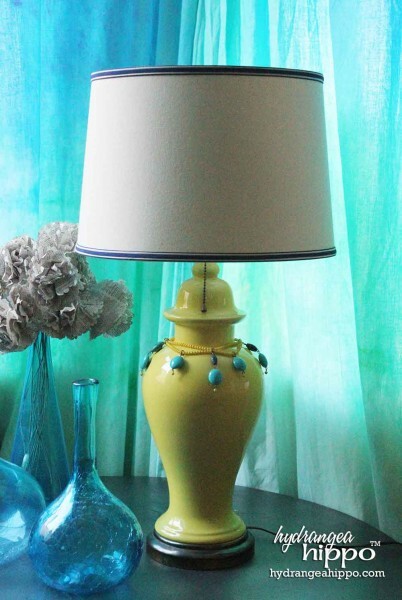 I plan to do something with the plain lampshade soon, maybe with handmade fabric flowers and fabric dye. But until then, I am keeping it simple with the one “lamp necklace”. Measure the circumference (distance around) the portion of the lamp where the necklace will rest. Cut one piece of Stretch Cord to 4″ longer than the circumference and a second piece of Stretch Cord 6″ longer. Attach one end of each Strecth Cord length to a jump ring using a crimp bead, closing the Crimp Bead with the 1 Step Crimp Tool. Thread Glass Beads onto each length of Stretch Cord to fill, until about 2″ of Stretch Cord is left unstrung. Attach the ends of the Stretch Cord to a lobster claw style clasp using Crimp Beads and the 1 Step Crimp Tool. 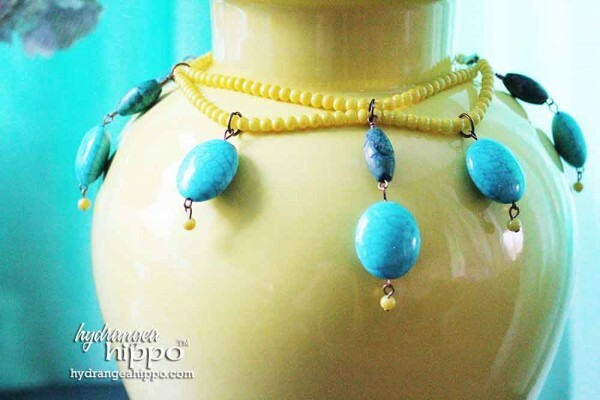 String large turquoise beads onto eye pins, wire wrapping the ends if desired. Make 4 long dangles and 3 shorter ones by attaching two beads together at the eye pin loops. String a single glass bead onto a head pin and attach to the end of each dangle (7). Find the center of each string of glass beads. Attach the two lengths together with a jump ring. Split the other two sections in half and again attach the two lengths together with a jump ring. This will make 3 “scalloped” sections of beads. Attach a long dangle to each jump ring, including the jump ring at the end of the lengths of beads. Attach the other 3 dangles to the ends of each scallop, using a jump ring for each. Attach the “necklace” to the lamp using the clasp. 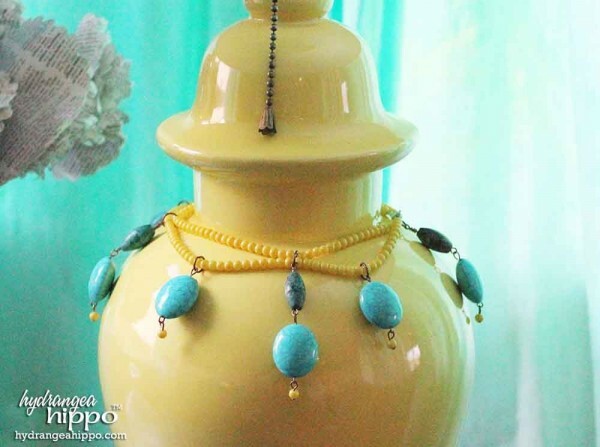 How would you jazz up a lamp, vase, or home decor piece with beads and jewelry? « How to Make a Cat Bow Tie – Marshmallow is looking dapper!